Individually-decorated historic cabins and shared rooms are offered at The Bowery House. The shared bathrooms feature heated floors, Red Flower bath products and high-pressure showers. 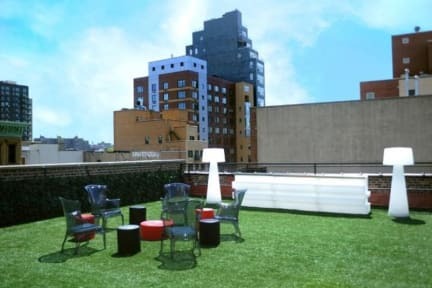 Featuring a rooftop garden with Italian furniture and commissioned artwork, our stylish Soho hostel is a two-minute walk from three different subway stations, connecting you to the whole city. Free Wi-Fi and a private living room are also provided. Guests of The Bowery House can comfortably relax with friends in front of the 65-inch TV in the living room or read a paper from the world newsstand. The Bowery Bodega offers snacks, drinks and toiletries. Luggage storage is available for a $10 fee at check-out. Not all rooms have windows. Window rooms are at an added cost. The R Bar is located on the ground floor of our hostel and features room for socializing and a wide choice of beer, wine and spirits. The New Museum and the Bowery Ballroom are within one block of the hotel, while Little Italy is just a half a mile away. Get the best out of NYC from the stylish surrounds of the Bowery House! Please note that guests must be over 20 years of age. Tax not included - 14.75% + USD3.50 occupancy tax per person per night. 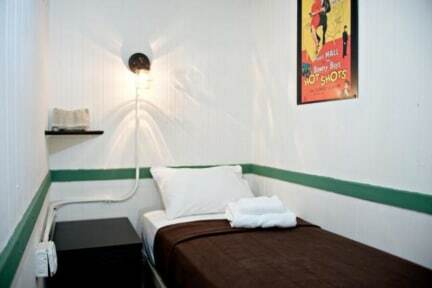 The hostel will charge the first night deposit in addition to deposit paid on-line to the booking site. A valid credit card must be provided for the deposit to be taken, please make sure there are sufficient funds to cover the first night deposit. Reservations will be cancelled without a valid credit card payment for first night.